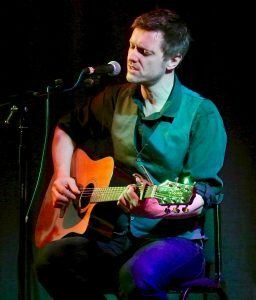 Adam Norsworthy returns to the Dulwich Festival after two previous sold-out shows. Regarded by many as one of the country’s finest singer-songwriters, he will be playing a first set with Ellie Fagg, who has played with the LSO and mandolinist Dan Thomas, and then a full band set with his group The Mustangs, one of the UK’s most established blues bands. This will be your third time performing at the Festival, what do you like in particular about the Dulwich Festival? The two shows I’ve done before had a very laid back, chatty vibe to them. It’s lovely to have the environment to talk about the songs and crack an (old) joke or two. I love the intimacy of the Festival – a lot of places I play are just too noisy or too big for that kind of show. Tell me about your collaboration at this year’s Festival with violinist Ellie Fagg and mandolinist Dan Thomas. Well Ellie is an old friend and the wife of Tom Norris, who played violin with me two years ago. Ellie also plays with the LSO and I’m really excited to have her playing with me this time. I know Dan through Alleyn’s, where he and I teach guitar a few days a week. Dan’s a fine musician and a lovely bloke and I was thrilled when he accepted my invitation to play mandolin. It will add a whole new dimension to the evening. The second part of your set involves you performing with some familiar faces to the Festival – you’re back with the Mustangs! Yes, I can’t shake them off! Actually we had so much fun playing the show last time it was a no brainer to have them back. It also makes the show more diverse and interesting for the crowd; my intimate acoustic songs in the first half, and something you can tap a toe to in the second. The event combines both solo and band performances for you, what aspects of each do you enjoy the most? Both, absolutely. Part of the fun is being able to do different things. Even I’d get a bit restless watching myself sing with just a guitar over two sets, so having the guests and the band just adds chemistry and a different sound. I love singing solo, it’s intimate and expressive, but there is an added joy to creating music with other people. What have been your biggest musical influences so far? Well some of my influences are fairly obvious – The Beatles, Bowie, Neil Young, Lindsey Buckingham…and some less so – John Barry, Richard Thompson. But I think the real answer to this is ‘everyone’….you are always subconsciously absorbing and processing music you hear in your head every day and you filter out the stuff you don’t like, and keep and steal from the stuff you do! You released ‘The Circus Moon’ your latest solo album, towards the end of last year can you tell us about the inspiration behind this album? I wanted the album to play like the sleepless night of a restless soul….someone who was up all night fretting about their lives and the state of the world. I try not to be too explicit lyrically so everything is open to interpretation, but certainly that’s one of the themes. The title alludes to the idea that under a full moon some of us turn into werewolves, but under a circus moon some of us turn into clowns! Mentioning no names, but certainly there are a few world leaders who seem to be running a circus. That’s about as political as I get. It’s your third solo album, how have you developed as a writer/producer since the first? I think as a producer you are always learning new techniques and ways to arrange and build a song. To a degree you are led by the ever-developing technology and it’s funny to think I used to create whole albums on a simple four-track cassette machine. But that was a fantastic learning ground and I’m very lucky to have gone through that. As a writer you just want to have your antenna up as much as possible, so that when a great idea comes along – a riff, a phrase, a line, a story – you can pluck it out of the air and develop it. Often the best songs are written in 5 minutes, literally. Others can take years to chip away at. Whether I’m getting better or worse at it is not for me to judge, as long as I like what I’m doing and I’m being honest with my expression, that’s all that matters. You’re due to release Watertown with The Mustangs in May – a concept album about industrialisation – that’s not standard Blues music, can you tell us about the ideas behind this album and the writing process? The band played Glastonbury in 2017 and our drummer, Jon Bartley, is co-leader of the Green Party. He was something of a celebrity there and watching him interact with people I started developing this idea in my head; how a bucolic idyllic village that lives off the land can be devoured and polluted by the demons of industrialisation. Haha, it sounds daft even as I write it! But it’s a story told through the eyes of two young lovers and I hope people get on board and enjoy the narrative. It certainly isn’t typical blues, the album also takes in Folk, Prog, Rock, Country…but we have a reputation for stretching ourselves and doing different things to other bands on the scene, and I like that. At the end of the day the album will live or die on the strength of the songs, and we feel they are pretty good, so cross fingers. What’s next for you off the back of two recent albums? Well next up is a third album with The Milk Men – my other band, in which I don’t sing lead vocal, I get to just wig out on guitar, which is fun. That’s due at the end of this year. I’ve already written most of the next solo album, which I’m excited about. That should be out next year, and also the Mustangs want to go back to our roots and do a pure Blues album for our 20thanniversary, and we’d like to get that out at the end of 2020 too. I’m still a huge music fan though and have started a You Tube music blog called Rock Records Reviewed, which is in its very early days, but has been huge fun to do. People can check that out and subscribe if they want to see and hear me prattle on about Rock music. I like to stay very busy though, I get very restless if I’m not working on something. Still so many songs to write and so many gigs to do!